Maasai Mara National Reserve in Kenya is one of the most known safari parks worldwide. You will probably see the Big Five, and it is one of the places its easiest to spot the Big Cats. You can do game viewing all year round in Masa Mara, it is 12 hours and the average daytime temperature is around 77 F (25 C), read more about Masai Mara national park best time to visit. Buy a tour package, go from Nairobi to Masai Mara national park either by car or air, choose the best tour package for you. When Is Best Time To Visit Masai Mara? You can do game viewing all year round in Masa Mara, it is 12 hours and the average daytime temperature is around 77 F (25 C). Masai Mara has two dry seasons and two rainy seasons. Best months to visit is June to October. Good months to visit are January, February and May. Fairly good months to visit March, April, November and December (Rainy seasons). The long cool-dry season is maybe the best season to visit Masai Mara. The animals are easier to spot because they do not need to hide from the sun, and less rain means less insect, including mosquitoes. The Great Migration in Masai Mara. 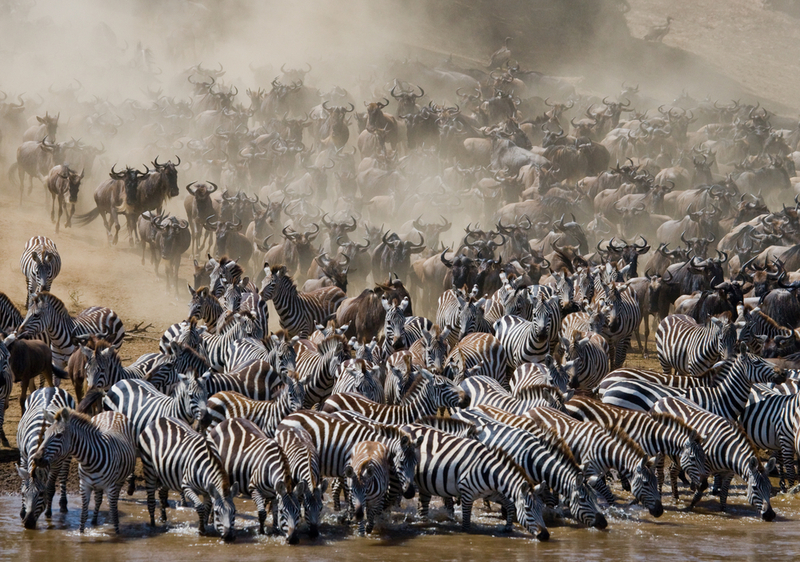 Over 1 million wildebeests and hundreds of thousands of zebras, gazelles and elands cross the crocodile-infested Mara River. This is also the season for most tourists. Short rainy season, the rains bring new life to nature. Road conditions are normally fine then it quickly dries up. Because of the rain roads can become tricky.